We have learned that cats appear to be environmental murderizers. Some people even want to ban them as pets. Let's say we have to do that for the sake of the Earth. What local, replacement pets would make good replacements for domesticated cats? Here are a few good ideas. Let's face it. Domestic cats are only cute and cuddly because we are much bigger than they are. If we were smaller, they would be some of the fiercest killers we ever encountered. Researchers think that pet cats who are occasionally let outdoors can do a number on the environment, but the real problem is full-time outdoor cats. Barn cats, strays, and feral cats can each kill between 20 and 50 birds per year, and up to 340 small mammals. This makes them a real threat both to native birds and small mammals, as well as to wild species that hunt the same prey. The most acceptable solution is to spay and neuter cats in the wild, and to keep house cats strictly in the house. Unfortunately, due to reluctance to spay and neuter, and the tendency of some owners to abandon their cats when they're inconvenient, any population of house cats will almost always lead to a population of wild cats. Some groups in New Zealand are trying to end the problem by banning domestic cats entirely. That might be the best environmental solution, but if we did the same in the United States, what would we be able to replace cats with? We'll take a quick look at some nice, local omnivores, and how they might fare during domestication. 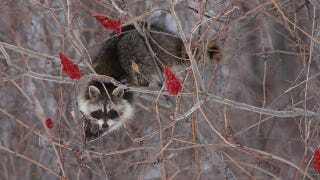 The most common American wild animals that humans might turn to for cat-free companionship are raccoons. Raccoons are omnivores, cute as Christmas, and are officially about fifteen pounds. They already eat what we throw away, can be trained to use litter boxes, and can survive well in both rural and city environments. This makes them sound like excellent pets - until you actually live near them. Those who regularly see raccoons know that they range from the size of a large cat to the size of a small bear cub, and their hand-like paws make them able to get into anything an athletic five-year-old human might manage. A pet cat means picking things up off the floor and keeping cabinets closed. A pet raccoon means child-proofing an entire home. Or maybe it would be best to give them what they want. Those who have raised orphaned raccoons have mentioned that, at best, they need new toys or new stimulation every few hours, or they will tear apart their habitat. With raccoons we come across the main, and major, problem with starting a new pet species - wildness is not something that goes away when an animal is raised right. Neurological and physical changes have to take place before an animals stops being wild, and they have to take place over several generations. The most famous study on this was done with silver foxes in Russia, and written up in 1999 by researcher Lyudmila Trut. Over forty years, silver foxes were bred to lesser and lesser aggressiveness. The original purpose of this was to develop a wild species that wasn't such a problem for farmers, but over the years, researchers noticed that they got a great deal more than that. The tamest foxes began have floppier ears. They started spontaneously licking their owner's faces, the way dogs do. When they were too young to be trained, they whined for attention, the way young puppies did, and actively sought out humans. They looked mostly like wild foxes, but starting at birth they instinctively behaved differently than wild foxes. By the fortieth year, about eighty percent of the kits of the tamest foxes exhibited tame behavior. They had become pets. Raccoons have not become pets. Although the experiences of the silver fox breeders indicate that it can be done in canids, it's not as certain with other types of animals. As it is, people who adopt young raccoons and are encouraged by a couple of years of tame behavior are often dismayed when the raccoon reaches sexual maturity and becomes aggressive. They are a threat to other pets in the home, and can be mildly dangerous to humans if they feel cornered. Even friendly raccoon play can leave people with bites and scabs. There are people who keep raccoons as indoor pets successfully, but if anyone wants to make these animals reliable as pets - the way we currently assume a kitten will grow up to be a pet - they will need another several-decade breeding program. There is a breeding program already in place with one subtype of native American animal. It's generally agreed that opossums make bad pets. They're not as aggressive as raccoons, and will prefer fleeing over biting. They're also a bit smaller, ranging from 10 to 13 pounds - although their long coats can make them seem bigger. Although some people successfully keep them as pets, they are not thought of as great to have around the house, especially since their feces can carry diseases that are deadly to birds and horses. There is one kind of opossum that has been made into a pet, and bred since 1994. The pouchless short-tailed opossum is a South American animal, and is palm-sized instead of cat-sized, but has been gaining popularity. If it is handled from a young age, it can be friendly and tame. People have begun domesticating the species, and in the meantime, pet owners have worked out the proper environment, handling, and breeding of the animals. There's even a specialized food made for short-tailed opossums. So unlike raccoons, domestication programs are making headway into some opossum species. Still, there's a long way to go before they're fit to be classified as domesticated, rather than exotic, pets. As it turns out one of the best replacement cats is pet skunks. Wild skunks are not even remotely suitable as pets, nor would anyone try to take one into their home. The scent of them has seen to that. On the other hand, people have been breeding domesticated skunks since the 1950s. That's about when the Russian silver fox breeding program started up, although there's no indication that the largely-commercial breeding of skunks has been as focused or as rigorous. It's not to be discounted, though. The results have been good enough that even PBS will admit that they're decent pets. The major problem, with skunks, is the obvious one. Baby skunks are de-scented anywhere between two and five weeks. The operation, breeders say, is analogous to spaying or neutering cats at a young age. There's no evidence that the de-scenting can leave a skunk in pain, the way de-clawing does cats, but it does leave a skunk helpless. Domesticated skunks have a much lower chance of surviving in the wild, which means that owners have an even greater responsibility to keep pet skunks safe and indoors. Looked at in cold blood, that may be what makes them a better choice than cats. If a skunk is unsuited to its environment, it will die if abandoned - which means a much lesser chance of setting up an ecologically-damaging population, as has happened with cats. And so it seems that skunks are the best possible choice as replacement-cats. They're partially domesticated, they're friendly, they're native to most of the continental United States, and they won't do the damage to the environment that cats do. Currently, though, there aren't many states in which it's even legal to own a skunk as a pet. If we want to turn this around, we'll have to start making arguments that the laws should be changed. Start by pointing out that, unlike an unsightly orange cat, a chic black-and-white skunk can go with anything. Via Russian Fox Farm Study, Aquatic Community, Craton, PBS.